Fix and Forget Friday comes to you today from my friend, Anne. A few months back, I was at Ollie’s (a discount store kind of like Marshall’s or Ross but without the clothes and even messier) and stumbled across a little bottle of Spice Islands’ Chinese 5-Spice Powder. I don’t remember how much it was – maybe $1.99? – but I remember it was cheap. And I like cheap spices. So I bought it. Problem was, I had absolutely no idea what to do with it! I had never before in my life made or even eaten anything (that I recall, anyway; I suppose there’s always the chance I ate it unaware) made with Chinese 5-spice powder. It was one of those random spice mixes that seemed non-essential to my life. Until I saw it for $1.99. Or whatever the price was. A couple of bucks reduced the risk I took in potentially acquiring another bottle to shove to the back of my already messy spice shelf. I am so glad I took that risk! As it turns out, some other bloggers in the world had apparently recently acquired their own Chinese 5-spice powder, because as soon as I started looking, I found all kinds of recipes to try. 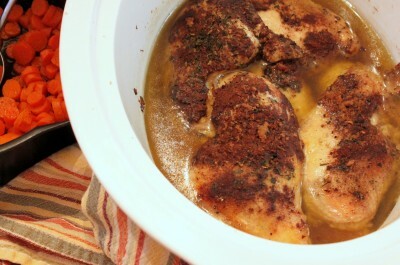 One that I pinned and tried as soon as I could was this Braised 5-Spice Chicken by Jeannette. Now Jeannette is a much better cook than I (a much better photographer, too, but that’s beside the point). She actually takes the time and effort to put together some really yummy fancy meals that are also very healthy. Me? Healthy, yes. Time and effort? No. Not my thing. So here you have my quick-and-easy (because that’s how I roll) no-unusual-ingredient (ummm, unless you count the 5-spice powder) crock-pot-only version of 5 Spice Chicken. Note: Chinese 5-Spice Powder is a mix of – how did you know?! – 5 spices: cinnamon, star anise, fennel, black pepper and cloves. It might be cheaper to buy the 5-Spice Powder, especially if you’re like me and don’t keep fennel and star anise around. But if you want to give it a go, try this recipe for authentic Chinese 5-Spice Powder. Place the chicken in the crock pot. Pour the broth over it. Sprinkle with the garlic and onion. Grate the ginger right on top. Cook on High for 4 hours, or until the juices run clear. I wanted to go to Quick and Easy Cheap and easy but the link took me to spam, thought you’d like to know. Keep up the good work! I just wanted to mention that traditional Chinese 5 Spice uses Szechuan pepper rather than black pepper though many spice blends cut corners and use black pepper. If you look around you can find the one with Szechuan pepper and it will make a world of difference to your recipe, adding a spiciness that black pepper can’t provide. 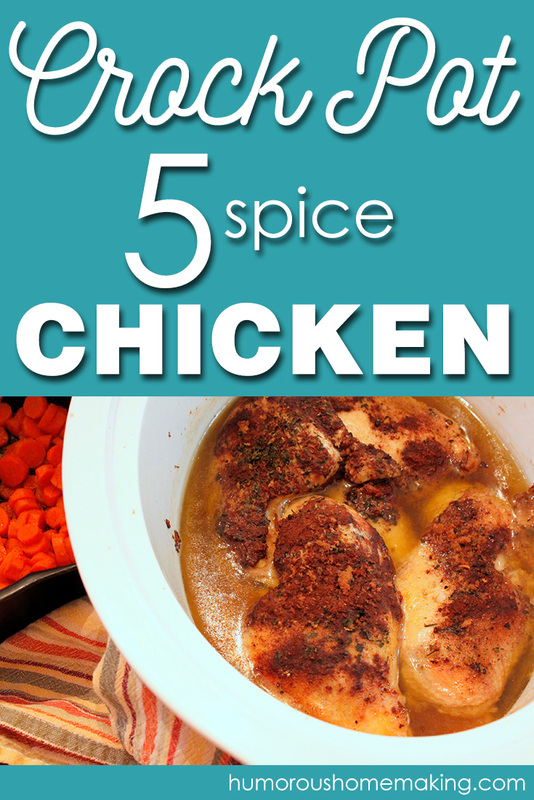 I make a chicken recipe with 5 spice powder that my kids love. It would work just fine in the crockpot. I’m in Australia so I expect we have a greater Asian influence in our cooking, but my mum got this recipe years ago from a Chinese lady. So… Chicken pieces, a few slices of ginger root, 1 tsp of 5 spice, 5 star anise, half a cup of light soy sauce, half a cup of dark soy sauce, 1/2 Port (wine), 1/3 cup sugar. It is so yum, and worth keeping star anise in your pantry for. I find that around here, most people wouldn’t even know what star anise was…but I live in the boonies. 🙂 Ha, ha! I love hearing about the differences in culture. So interesting. 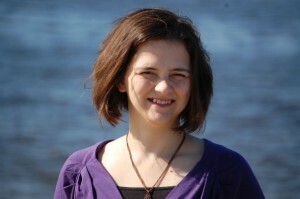 I thoroughly enjoyed reading this post and the bit about you the author. Chinese 5 spice usually has MSG in it. Thanks for sharing this. I’m always looking for new slow cooker recipes. We love the flavour of 5 spice at our house so I’m looking forward to trying this. 🙂 You’re welcome. 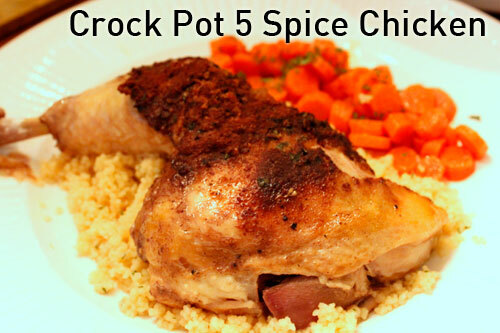 I post a new crock pot recipe each Friday. So glad Anne found a way to make this quick and easy – love this simple flavorful dish, slow or quick! I just tell it like it is. 🙂 Thanks for stopping by too!